Spend a hot summer day in the cooling shade of a hosta garden and you’ll fall in love with the lush beauty of these versatile and relatively easy to grow perennials. Oh, there are so many hosta varieties to choose from, it’s the decision on which variety to grow that is often the challenge. 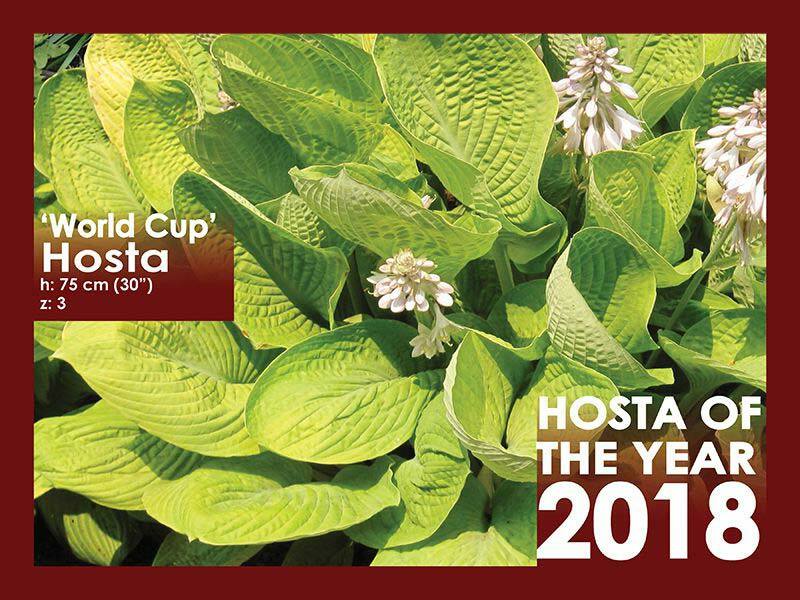 Look to the American Hosta Grower’s Association for their annual selection of the Hosta of the Year. This year, honours go to Hosta ‘World Cup,’ a seedling of ‘Komodo Dragon’ x ‘Super Bowl.’ This hosta is an outstanding garden plant with deeply cupped, corrugated bright gold green foliage. In the spring it makes its appearance as semi-upright mound, but as it grows and matures it takes on a beautiful vase shape. The moderately wavy cupped foliage is of good substance and slug resistant. Plant ‘Word Cup’ in part-shade with dappled sunlight for the best colouring. Increasing in size each year, ‘World Cup’ will grow up to 75 cm / 30” in height and 100 cm/ 40” in spread. An ideal focal point in the shade garden or large container, it’s sure to provide colourful contrast and texture. Lavender blooms appear mid-summer. Hardy to Zone 3.